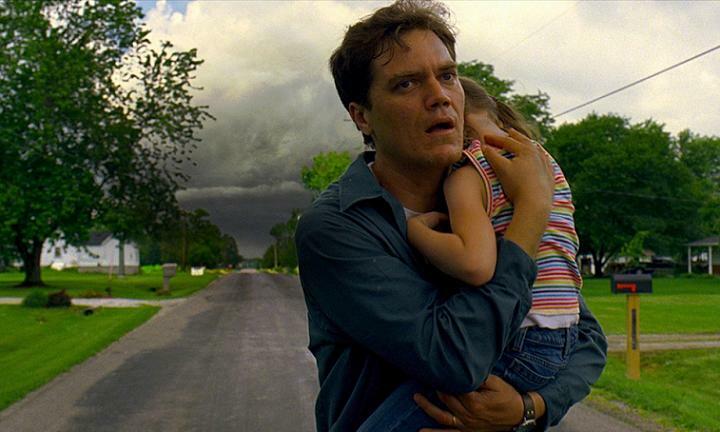 "Take Shelter" is a heart-rending story of Curtis LaForche (Michael Shannon), who resides with his wife Samantha (Jessica Chastain) and his little daughter Hannah (Tova Stewart) who happens to be deaf. It all begins when Curtis has visions of a storm coming...in the form of dark clouds, whirlwinds, thunderous noises, and a strange looking rain, the water from which resembles motor oil! Some of these visions are extreme and apocalyptic, laden with immense paranoia. He sees himself and his family being stalked and attacked by faceless people....and that is when he realizes that something is amiss with his head. He has these nightmares almost every night, yet withholds them from his family, for he is concerned about them; doesn't want them to feel insecure in the company of a mentally ill man of the house! More so, because apparently there has been a history of paranoid schizophrenia in the family; his mother had it too......! He just goes on with life, looks up books about mental illnesses and starts meeting a counselor at the free clinic. "Take Shelter" reminded me of Andrei Tarkovsky's final masterpiece, "The Sacrifice" which also features the central character living in an isolated house with his wife, daughter and a son (who is mute! ), and decides to carry out an ultimate sacrifice to save his family from the impending apocalypse by a nuclear holocaust. Only the similarities end right there and this film is in no way a rip-off. "Take Shelter", on the outside, may appear like yet another psychological drama about a man suffering from Schizophrenia with all the essential clichés that usually infest such films. Writer-director Jeff Nichols proves this assumption wrong, however, and takes a whole new approach in which the protagonist senses early on that he has a problem and tries his level best to seem normal, so as to not affect his family that he loves so much and ensures that they don't feel unprotected. The idea of delusions of doom clubbed with this fresh new twist work wonders for a tired premise of a schizophrenic protagonist and thus render "Take Shelter" one of the best films dealing with the subject. Nichols handles the story with finesse and takes utmost care to not let it slip into the triteness of melodrama. There is drama alright, but nothing that would seem overdone. Every little bit is realistically done; every scene is carefully thought out, every little character reaction is meticulously written, except for maybe a single scene. Some of Curtis' visions are frightening and Nichols sure knows how to the scare the hell out his audiences! This film could serve to be a perfect blend of the 'psychological thriller' and 'drama' genres and has plenty of moments to please film lovers of both categories. On the technical front, the film excels in most departments, particularly cinematography, sound design and even special visual effects. Just behold those excellent scenes of the storm that could give any big budget disaster movie a run for their money. Or that chilling moment when Curtis and Hannah find themselves in the midst of some birds gone berserk in a frighteningly surreal sequence! The acting is marvelous all along...Jessica Chastain is brilliant as the caring wife distressed upon not knowing what exactly is going through her husband's head, yet trying to manage the family and making some modest money by selling in a local flea market. The little daughter Hannah is superb as the deaf daughter. Even though she has precious little to do, she has a presence that is endearing! Robert Longstreet and Shea Whigham make an impression in their small acting parts in the roles of Jim and Dewart respectively. Which brings us to the lead performer, Michael Shannon. Now, his performance is definitely solid. Shannon practically lives the character and makes it his own. The realization, the helplessness, the anxiety, the sadness...all pulled off masterfully. Only I didn't see anything significantly different from what I saw in "Revolutionary Road" in which he played a similar character. Only Curtis of "Take Shelter" is a little more compassionate than John Givings of "Revolutionary Road", but essentially he seemed like the extension of the same person! Now this leads Shannon into an even greater danger of being type-casted, because even if he attempts something different, we are bound to see a mentally unstable character, and that's not a good thing. One can just hope Shannon is more careful while choosing his next big role if he wants to show if he is versatile enough. Jeff Nichols has crafted a real fine film. This is only his second venture and he has already mastered the art. Some may complain that the film slows down at intervals, but it is the kind of screenplay that is best savored at a steady pace rather than in a hurried manner. In spite of the slow place, the film is engaging enough and never lets up, thanks to the fine acting and plenty of great moments to fill the running time of 120 minutes. This is yet another example of a great film that was sadly overlooked by the Academy. I can just hope that this review and many others reach out to film lovers all around and they take notice of "Take Shelter". City Island is the name of a little-known but real chunk of the Bronx that looks and feels more like a fishing village than the city of New York of which it's a part. Setting this story of a combative working class family in this sweet, unique location softens the luridness of the plot and helps keep this movie from seeming just a filmed stage play. The melodrama is further softened by a comic edge, which surely is needed when there's an illegitimate son who's in prison, a college student daughter who's secretly working as a pole dancer, and a teenage boy with a fetish for obese women. Dinner with, Vince, Vince Jr., Joyce, and Vivian Rizzo is a shouting match. And that's a bit odd because the Rizzos are harboring secrets from each other, especially Vince (Andy Garcia, down-to-earth and likable for a change). He's a prison guard, who pretends he's going off to play poker when he's really in acting class taught by a (surprise) acidic Alan Arkin. Being an actor is a lifelong dream, but it's too sissy or he's too unsure of his ability to reveal this. He's got a harder edged secret too: the facility where he works has just turned up Tony Nardella (Steven Strait), a hunky young man he recognizes as the illegitimate offspring he's never seen. Vince Jr. (Ezra Miller) is stalking fat girls, including one right nearby who has a kind of online club for fat fetishists with code word "Botero." Anything is possible, but it may strain credulity the most that Vivian (Dominik García-Lorido), who's lost her college scholarship due to misbehavior, is secretly making money to return to school by working as a stripper in a joint called Hell's Half Acre. Joyce (Julianna Margulies), who answers the phone at a law office, really isn't hiding anything. But when Vince brings Tony home on a work-furlough arrangement, without telling who he is, she and Tony start eying each other and she soon has a secret too. It's a classical arc of comedy that all is revealed and all is forgiven at the end, and that's what happens here. Along the way there is some serious misunderstanding and each actor gets to do his or her little (or big) turn. Ezra Miller, who got his start as star of Antonio Campos' 2008 'afterschool,' makes some pungent contributions to the dinner table mêlées, though his subplot is too sub for his peculiar fetish to ever quite make sense. Steven Strait has a very strong presence that serves him well in an obviously secondary role. It's a delicious irony that after time served at the Rizzo dinner table, he starts half thinking prison might be better than this nut house. But it's not really a nut house: there's an affectionate New York warmth to the verbal battles. Andy and Julianna as the well-worn husband and wife have the best parts. It's unusual for Garcia to play a character who's basically a decent guy and he makes the most of it. Maybe there's nothing original about the way his part is written or how he plays it but the material is winning nonetheless. For a movie that's an acting showcase City Island takes its biggest chance in referring overtly to the thespian's craft. Alan Arkin's big speech is one at the drama class in which he complains about the bad influence of Brando and Method acting. He's wasted five years of his life, he gripes, listening to "pauses." Next week's assignment is to tell your deepest, darkest secret -- another risk, to highlight the plot's central point so blatantly. In a nice irony Tony bonds with Vince and gives him the best acting tip and gives the best display of acting. Drama class is where Emily Mortimer comes in, as Molly. She and Vince get paired off to do next week's assignment and a friendship develops in which Molly becomes Vince's coach and cheerleader. Mortimer's role has an acting twist: her real accent becomes a put-on one. This doesn't quite work and though Mortimer has been praised for her performance, the role of Molly is a little too saccharine and ultimately rings false. Perhaps everything does. But that doesn't really matter too much because the proceedings are nonstop fun and sometimes even a little suspenseful. In a season not rich in good American independent films, 'City Island' may smell a little too strongly but it still smells like a rose.